Although I complain constantly about the heat and the summer, I do still love a good trip to the beach, as long as I can keep cool of course, and that's what I have mostly been dreaming about this week, just getting away down to the beach for a few days. Of course, the best days at the beach are the days that start bright but end in a storm. These Seashells and Starfish wraps from Espionage Cosmetics perfectly accompany my daydreams today. They have a kind of pearlescent finish and a very subtle blue and pink shimmer. 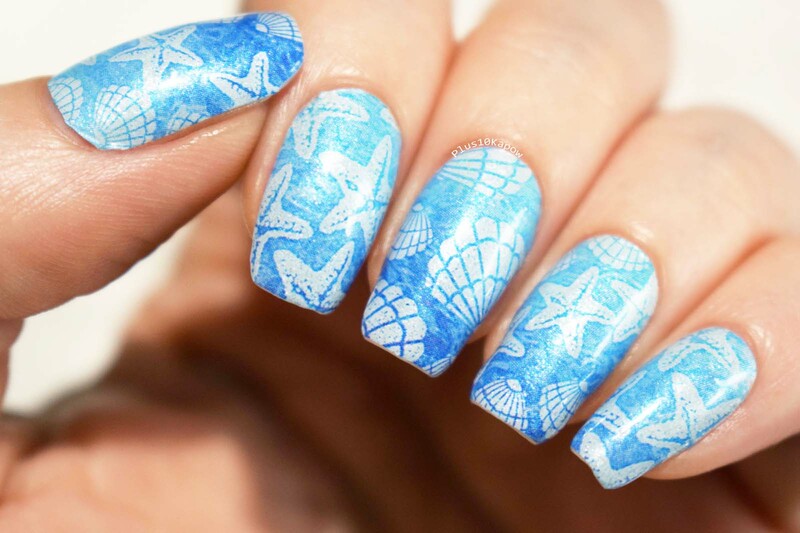 Underneath the starfish and seashells, there are some wave details that make up a gorgeous gradient. These were from the February Voyages NEXUS and they aren't currently available but if you are after a sea themed mani, check out these awesome Stardew Valley: Moonlight Jelly wraps. If you're buying from the Espionage Cosmetics shop for the first time, you can use code PLUS10KAPOW to get 15% off a order of $25 or more. If you've been thinking about signing up to the NEXUS to get gorge nail wraps like these, this month is definitely the month you should be doing it. This month's theme is Warrior Woman and the reveals that have been put up so far look amazing!